If you're on the hunt for coconut water, you won't have to look far. Its growing popularity has led to at least 35 different brands being sold in cartons and bottles around the country. Most coconut water is just that, the juice from the inside of a coconut. But some are made from concentrate while others have added ingredients. 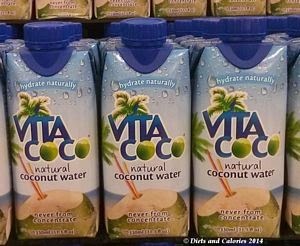 To help you compare different coconut water brands, here is a selection (56 and counting as at March 2017) which can be found in health stores, supermarkets and smaller retail outlets in the UK. Coconut water is a healthy, low calorie drink for those looking to replace fluids lost through exercise or simply to quench their thirst. It's an excellent choice because pure coconut water contains naturally occurring electrolytes which closely match those lost through sweating. While the flesh of a coconut is high in calories, pure coconut water is not. In its natural state, coconut water is fat free, low calorie and has little sugar or salt. Typically, coconut water has around 20 calories per 100ml, but it depends on where it was sourced and the natural variability of individual coconuts! Another point to watch out for is whether or not your coconut water is sourced from young, green coconuts, or old brown ones. Young green coconuts provide the sweetest tasting drink with more nutrients. It also doesn't need anything added. 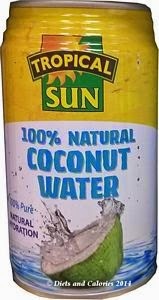 Coconut water from older brown coconuts often has added sugar or is concentrated so manufacturers can add further ingredients later. 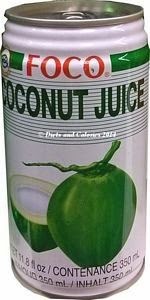 Unfortunately, the labels on the bottles aren't often specific about the age or colour of the coconuts used. Ideally look for those with nothing added and not made from concentrate. If you're after the lowest calorie coconut water, then Levi Roots has a mere 2 calories per 100ml. 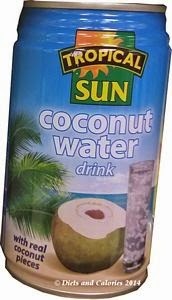 This is followed by Chi 100% Pure Coconut Water which has 8 calories per 100ml. Here is the nutritional breakdown and ingredients for 56 different varieties of coconut water selling in the UK. 23 calories, 0g protein, 6.4g carbohydrates, 4.2g sugars, 0g fat, 0g saturated fats, 0g Fibre, 0.14mg sodium, 96mg potassium. 100% natural, not from concentrate; Bottled at source in Thailand; 0% fat, 0% cholesterol, 0% added sugar, 0% artificial colours, 0% flavourings. 250ml bottle. 15 calories, 0g protein, 4.5g carbohydrates, 4.5g sugars, 0g fat, 0g saturated fats, 0g Fibre, 0.01g protein, 0.04g salt. 21.5 calories, 0g protein, 5.2g carbohydrates, 3g sugars, 0g fat, 0g saturated fats, 0g Fibre, 0.01g sodium. 22 calories, 0.1g protein, 5.0g carbohydrates, 4.0g sugars, 0g fat, 0g saturated fats, 1g fibre, 47mg sodium. Free From Artificial Colours, Free from Preservatives. Free from added Sugars. Free From Artificial Flavours. Suitable for Coeliacs. Fat Free. Suitable for Vegetarians. 20 calories, 0.1g protein, 5.0g carbohydrates, 4.0g sugars, 0g fat, 0g saturated fats, 0.5g fibre, 47mg sodium. Gluten Free, Peanut Free, Egg Free, Sesame Free, Milk Free, Soya Free, Nut Free, Vegetarian, Halal, Mustard Free, Celery Free, Sulphites Free, Shellfish Free, Fat Free, Yeast Free, Wheat Free, Lactose Free, Vegan, Oat Free, Kosher. Coconut Water (96%), Orange Juice (2%), Mango Puree (1%), Pineapple Puree (1%). 17 calories, 0g protein, 4.2g carbohydrates, 4.1g sugars, 0g fat, 0g saturated fats, fibre 0g, 18mg sodium, potassium 201mg, Magnesium 22mg. Not from concentrate, no added sugar. 25 calories, 0g fat, 5.9g carbohydrates, 3.5g sugars, 0.2g protein, 4.67g fibre, 0.08g salt. 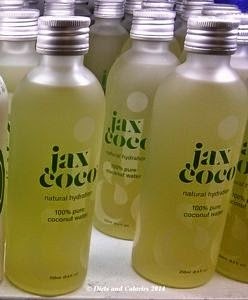 Cocofina is harvested from a special species of coconuts at their 'water ready' peak. Our proprietary process ensures minimal exposure to air thus retaining the fresh from the nut flavour. Suitable for vegans. Produced from coconuts of Thailand. 41 calories, trace fat, trace saturates, 3.2g carbs, 2.8g sugars, 6.1g protein, trace salt. 24mg Vitamin C.
A 330ml serving gives 100% RDA Vitamin C. A coconut water, whey protein drink with stevia. 42 calories, trace fat, trace saturates, 3.5g carbs, 3.1g sugars, 6.1g protein, trace salt. 24mg Vitamin C.
A 330ml serving gives 100% RDA Vitamin C. A coconut water, whey protein drink with stevia. 20g of protein per serving. 20 calories, 0g fat, 5g carbohydrates, 5g sugars, 0g protein, 0g fibre, 13 mg sodium, 224mg potassium. Calcium 2%, Phosphorous 1%, Vitamin C, Iron 1%, Magnesium 3%. No added sugars, five naturally occurring electrolytes, more potassium than a banana. 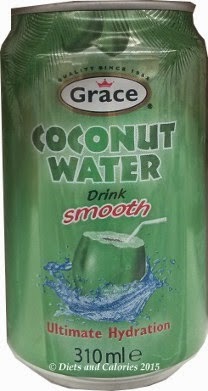 Coconut water from organic farming. Coconut Water, Coconut Water Reconstituted (Concentrated Coconut Water and Drinking Water), Fructose (less than 1% for Product Standardization) and Sodium Metabisulfite Conservative. 20.8 calories, 0.42g protein, 5g carbohydrates, 5g sugars, 0g fat, 0g saturates, 0g fibre, 14.5mg sodium. Vegetarian, gluten free, Kosher, not fermented, non alcoholic, fat free. 34 calories, 0.2g fat, 0g saturates, 8g carbohydrates, 6g sugars, 0.1g protein, 0.1g salt. 22 calories, 0.2g fat, less than 0.1g saturates, 5g carbohydrates, 5g sugars, 0.1g protein, trace salt. Contains potassium, sodium, calcium, phosphorus, magnesium (no figures listed). No preservatives, no added sugar. 25 calories, trace fat, trace saturates, 6g carbohydrates, 5g sugars, 0.2g protein, trace salt. Contains potassium, sodium, calcium, phosphorus, magnesium (no figures listed). No added sugar, gluten free, Kocher, no preservatives. Contains potassium, magnesium, calcium, phosphorous and sodium. 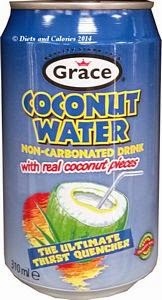 Natural Coconut Water, Never from Concentrate, Natural Flavourings and Citric Acid. 20.8 calories, 0.32g protein, 5.16g carbohydrates, 4.4g sugars, 0g fat, 0g saturated fats, fibre 0g, 11.6g sodium, vitamin C 0.8mg, magnesium 8.4mg, calcium 13.2mg. 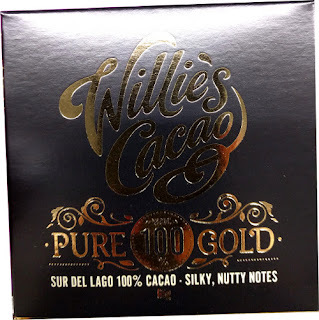 28 calories, 0g protein, 7.0g carbohydrates, 5.0g sugars, 0.2g fat, 0g saturated fats, less than 0.2g fibre, 0.02g salt, 5.4mg Vitamin C, 0.3mg Manganese, 118mg potassium, 4.8mg magnesium, 8.9mg calcium, 5.8mg phosphorous, 0.03mg iron, less than 0.1mg copper. Coconut Water (85%), Water, Sugar. 28 calories, 0g protein, 6.8g carbohydrates, 5.7g sugars, 0.1g fat, 0g saturated fats, less than 0.2g fibre, 0.06g salt. 0.3mg Manganese, 111mg potassium. 100% pure Coconut water from 4.5 tasty coconuts. Sugars found naturally in coconut water. This coconut water has been pasteurised. Packed in Thailand. Vegetarian Society approved; No added sugar; Not heat treated. Produced in Thailand. May turn pink! Organic coconut water, antioxidant: ascorbic acid. Suitable for gluten free diets; No added sugar. 20 calories, 0g protein, 5g carbohydrates, 3g sugars, 0g fat, 0g saturated fats, 0g cholesterol, 0g Fibre, 45mg sodium,135mg potassium, 18mg calcium, 10mg magnesium. Suitable for vegetarians. No added sugar. Low in calories. Naturally free from fat, gluten, cholesterol, preservatives. Coconut water (93.5%), coconut sugar 4%, coconut cream 2%, cocoa powder 0.5%. 40 calories, 0g protein, 9.4g carbohydrates, 6.4g sugars, 0g fat, 0g saturated fats, 0.11g salt. Suitable for vegetarian, gluten free, Use within 24 hours once opened. Made in Philippines for Jing Holdings Ltd.
28 calories, 0g protein, 7g carbohydrates, 6.2g sugars, 0g fat, 0g saturated fats, 0.05g salt. Product of Thailand. No added sugar, zero fat, not from concentrate, gluten free. From young green coconuts. 21 calories, 0g protein, 5.3g carbohydrates, 3.1g sugars, 0g fat, 0g saturated fats, 0g Fibre, 108mg salt,168mg potassium, 23mg calcium, 10mg magnesium, 11mg phosphorous. Not from concentrate. 100% coconut water. No added sugars. Coconut Water (85%), Water, Sugar, Mango Juice (1.5%), Mango flavour, Vitamin C.
26 calories, 0g protein, 6.5g carbohydrates, 5.7g sugars, 0g fat, 0g saturated fats, 0g Fibre, 35mg salt,110mg potassium, 15mg calcium, 6mg magnesium,4mg phosphorous. Water, coconut water from concentrate, (5%), citric acid, stabiliser (gum Arabic), preservatives (potassium sorbate, Sodium benzoate), natural lime flavouring, flavourings, sweeteners (Acesulfame K, sucralose), vegetable oil (coconut, palm). 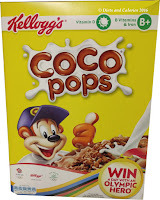 2 calories, trace protein, 0.3g carbohydrates, 0.2g sugars, trace fat, trace saturated fats, fibre trace, trace sodium. Contains naturally occurring sugars. Suitable for vegetarians. Coconut water (99%), sugar, antioxidant: Ascorbic acid. 20 calories, 0.1g protein, 4.5g carbohydrates, 4.1g sugars, less than 0.1g fat, less than 0.1g saturated fats, less than 0.1g fibre, less than 0.1g salt. Three quarters of a coconut used in each bottle. 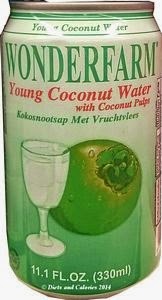 Coconut water (99%), Concentrate (1%). 11 calories, 0.1g protein, 2.6g carbohydrates, 2.5g sugars, 0g fat, 0g saturated fats, 0.1g fibre, 0.1g salt, 210mg potassium. 0g saturated fats, 0.1g fibre, 0.003g salt, 203mg potassium, 30mg Vitamin C.
Produced in Brazil. Straight from nut to bottle. From sustainable farm. No added sugar. 22 calories, trace g fat, trace saturates, 4.8g carbohydrates, 3.8g sugars, trace protein, trace salt. Preservative free, additive free, never from concentrate. Coconuts come from a single plantation for consistent taste. Suitable for vegetarians. 100% raw, unheated, untreated coconut water from young green coconuts. 0.1g protein, 0.01g salt. 184mg potassium. Soil Association Organic. Pure pink water from young green coconuts. BPA free bottle. Vegan. Grown in the Philippines. 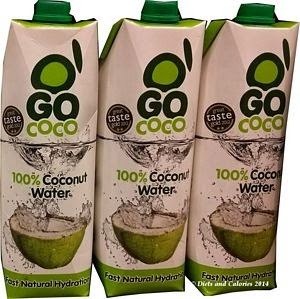 Water, Coconut Water from concentrate (24%) coconut water (10%), fructose, flavourings, stabiliser (carboxymethyl cellulose), acid (malic acid), salt, vitamin C.
17 calories, less than 0.5g fat, less than 0.5g saturates, 4.2g carbohydrates, 3.8g sugars, less than 0.5g protein, 0.09g salt, vitamin C 12mg. 19 calories, less than 0.1g protein, 4.7g carbohydrates, 4.2g sugars, less than 0.1g fat, 0g saturates, less than 0.1g fibre, 0.1g salt. 22 calories, 0.0g protein, 5.5g carbohydrates, 5.2g sugars, 0g fat, 0g saturated fats, 0.06g salt. 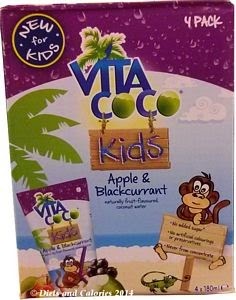 Organic; Vegetarian; Vegan; Fairtrade; Contains naturally occurring sugars; Extracted from single source of young green coconuts and bottled within 3 hours of coconuts being opened. 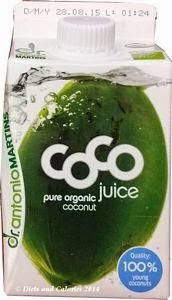 93% Pure Coconut Water, Passion Fruit Juice not from concentrate 7%. 24 calories, 0.0g protein, 6.0g carbohydrates, 5.8g sugars, 0g fat, 0g saturated fats, 0.06g salt. Organic; Vegetarian; No added sugars; 100% pure coconut water extracted from a single source of young green coconuts and bottled within 3 hours of the coconuts being opened. 93% Pure Coconut Water, Pomegranate Juice not from concentrate 7%. 25 calories, 0.0g protein, 6.2g carbohydrates, 5.8g sugars, 0g fat, 0g saturated fats, 0.06g salt. 32 calories, 0.0g protein, 7.9g carbohydrates, 4.2g sugar, 0.0g fat, 0.0g saturates, 0.0g fibre, 0.0g salt. Nothing added 100% pure. No fat, added sugar or sweeteners, preservatives, additives, colourings and concentrates. Free from additives, Free from artificial colours, Free from artificial sweeteners, Free from artificial preservatives. Coconut Water (94%), sugar, coconut pulp (2%), Preservative: potassium metabisulfite. 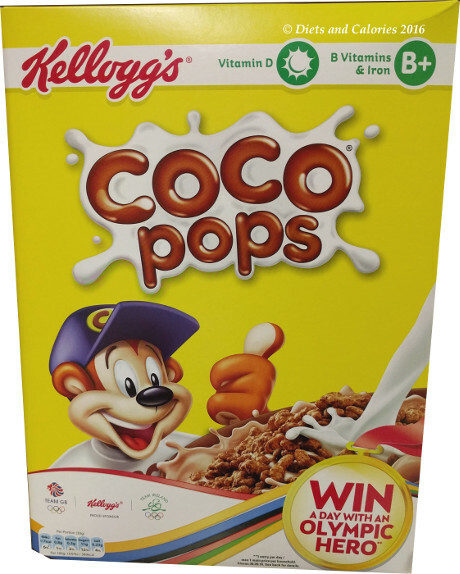 38 calories, 0.1g protein, 9.0g carbohydrates, 4.5g sugar, 0.1g fat, 0.0g saturates, 0.0g fibre, trace salt. Allergy advice: contains sulphur dioxide. 25 calories, 0g protein, 6g carbohydrates, 3.5g sugars, 0g fat, 0g saturated fats, 0g Fibre, 0.02g sodium. Fat free, gluten free, cholesterol free. 100% natural. Not from concentrate. No added colours or flavours. More potassium than 1 banana. 22 calories, less than 0.1g protein, 4.9g carbohydrates, 4.9g sugars, 0g fat, 0g saturated fats, less than 0.5g fibre, 13.2mg salt, vitamin C 0.8mg, magnesium 5.53mg, calcium 19.6mg, phosphorus 7.72mg. Natural Coconut Water, Sambozan Organic Acai Juice, Pomegranate Juice, Ascorbic Acid (Vitamin C). 25 calories, 0g protein, 6g carbohydrates, 6g sugars, 0g fat, 0g saturated fats, 0g Fibre, 12mg sodium, 12mg magnesium, 15mg calcium, 224mg potassium, 44mg Vitamin C.
Coconut Water (37.5%), Water (36.5%), Grape Juice (25%), Citric Acid, Natural Apple and Blackcurrant Flavouring with other Natural Flavourings. 22 calories, 0g fat, 0g saturates, 5.6g carbohydrates, 5g sugars, 0g protein, 0.01g salt. Vegetarian; gluten and dairy free, no additives or preservatives. Not from concentrate. Naturally occurring sugars. Coconut Water (37.5%), Water (36.5%), Grape Juice (25%), Citric Acid, Natural Pineapple and Mango Flavouring with other Natural Flavourings. Coconut Water (89%), Lemon puree (9%), Natural Fruit Sugar (2%), Vitamin C.
29 calories, 0g protein, 7.1g carbohydrates, 6.3g sugars, 0g fat, 0g saturated fats, fibre 0g, 0.03g salt, 175mg potassium, 6mg vitamin C.
Natural Coconut Water, Less Than 1% Fruit Sugar, Vitamin C.
18 calories, 0g protein, 5g carbohydrates, 5g sugars, 0g fat, 0g saturated fats, fibre 0g, 0.012mg sodium, vitamin C 45mg, magnesium 12mg, calcium 20mg, potassium 224mg. Free from gluten, wheat and dairy; Suitable for Vegetarians and vegans. Natural coconut water, orange juice, vitamin C.
25 calories, 0g protein, 6g carbohydrates, 6g sugars, 0g fat, 0g saturated fats, 0g Fibre, 0.01g sodium, 190mg potassium, 7mg Vitamin C.
Coconut water (78%), Water, Coconut milk (2%), sugar, cocoa powder (1%), natural flavours, stabiliser: guar gum..
30 calories, 0.6g protein, 5g carbohydrates, 3.6g sugars, 0.8g fat, 0.6g saturated fats, 0.05g salt, 170mg potassium. Natural Coconut Water, Passionfruit Puree, Ascorbic Acid (Vitamin C). 25 calories, 0g protein, 6g carbohydrates, 6g sugars, 0g fat, 0g saturated fats, 0g Fibre, 0.012g sodium, 15mg calcium, 224mg potassium, 12mg magnesium, 44mg Vitamin C.
25 calories, 0g protein, 6g carbohydrates, 6g sugars, 0g fat, 0g saturated fats, 0g Fibre, 0.02g sodium, 190mg potassium, 20mg Vitamin C.
Suitable for vegetarians, vegans, and gluten free diets. Kosher, yeast free, milk free. No added sugar, no fat, no cholesterol. Vita Coco contains 5 naturally occurring essential electrolytes. 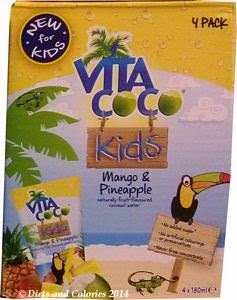 Natural coconut water, pineapple puree, coconut puree, vitamin C.
25 calories, 0g protein, 6g carbohydrates, 6g sugars, 0g fat, 0g saturated fats, 0g Fibre, 0.012g sodium, 15mg calcium, 206mg potassium, 12mg magnesium, 44mg Vitamin C.
Suitable for vegetarians, vegans, and gluten free diets. Water, coconut water (10%), pineapple juice (10%), sugar, camomile, acidity regulator citric acid. Water, Nata De Coco, Sugar, Coconut Concentrate, Seaweed Powder, Citric Acid, Malic Acid, Sorbic Acid, Sodium Citrate, Permitted Flavour. 50 calories, 0.4g protein, 12g carbohydrates, 0g fat, 1g Fibre, 7.1mg sodium. Contains Food Flavouring; Suitable for vegetarians; Halal. 38 calories, 0.1g protein, 9g carbohydrates, 0.1g fat, 0g saturated fats, 0g fibre, 25mg sodium. 20 calories, 0g protein, 4.9g carbohydrates, 3.5g sugars, 0g fat, 0g saturates, 0g fibre, 0.03g sodium, 190mg potassium. Coconut water isn't to everyone's taste, so some brands are adding other flavours to offer more variety. If you don't like drinking coconut water on it's own, try freezing it into ice cubes and adding to cold drinks. Alternatively mix it with your favourite fruit juice or use in a NutriBullet smoothie. KOH Coconut water has two ingredients - Coconut Water and Coconut Flavor. Not sure if the Coconut Flavor is sourced from Vegan or Vegetarian or Animal by products. Product doesn't have any markings for its suitability to Vegetarians and Vegans on the package. I have sent a note to the KOH and waiting to here from them about the source of Coconut Flavor. Many flavors are artificially made these days, and animal by products are often the primary source of artificial flavors. Let me know, If anyone of you already check with KOH about the source for the flavor. Yes, it's a shame they use a flavour in the mango coconut water, as they've already added mango puree. No need for the sugar either! Sorry, I don't know about its vegetarian status. I hope you receive a reply.